If the value is not as specified, replace the shift solenoid valve. 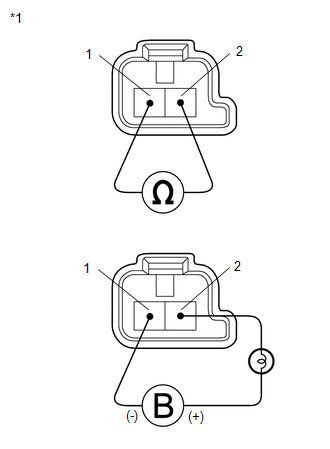 (b) Connect a positive (+) battery lead to the terminal of the solenoid connector, and a negative (-) battery lead to the solenoid body, and check the operation of the valve. When using battery voltage during the inspection, do not bring the positive (+) and negative (-) tester probes too close to each other as a short circuit may occur. The valve moves and makes an operating sound. 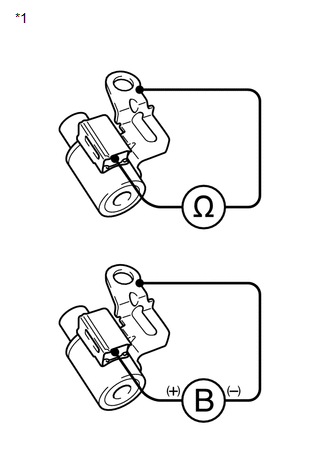 If the operation cannot be done as specified, replace the shift solenoid valve. (b) Connect a positive (+) battery lead with a 21 W bulb to terminal 2 and a negative (-) battery lead to terminal 1 of the solenoid valve connector, and check the operation of the valve.